Army Sergeant Jonathan Mathews, of Edinburgh, Scotland, was assigned to the Royal Highlanders, 4th Battalion in Marjah, Afghanistan. SGT Mathews was serving as a mentor and trainer to the Afghan Army. On July 28, 2008, he and five colleagues were conducting foot patrol to protect Afghan Police in Lashkar Gah when a suicide bomb detonated and injured a nine-year-old boy. As SGT Mathew rushed to treat the young man, a Taliban sniper open fired and took his life in a single shot. He was 35 years old. 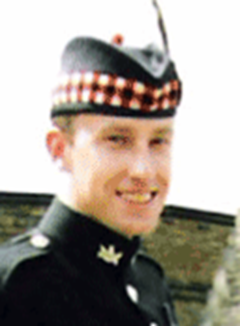 In 1993 SGT Mathews joined the 1st Battalion of The Royal Scot and trained as a sniper and reconnaissance soldier. In his 15 years of service he completed tours in Northern Ireland, Bosnia and Kosovo. His favorite sports were parachuting, canoeing and hillwalking, and all satisfied his sense of adventure. His passion for outdoor activities and “soldiering,” as he called it, did not compare to the love he had for his family. His best friend stated: “He was courageous, reliable to the core, and had unwavering loyalty, but nothing could ever match his devotion to his wife and children.” He leaves behind a wife, daughter and stepson.